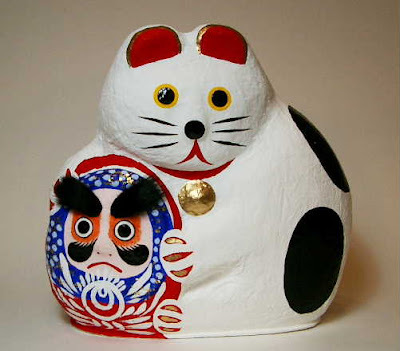 There are various forms of dolls, some with children or ladies, or even cats embracing Daruma. Some of these have been introduced elsewhere. 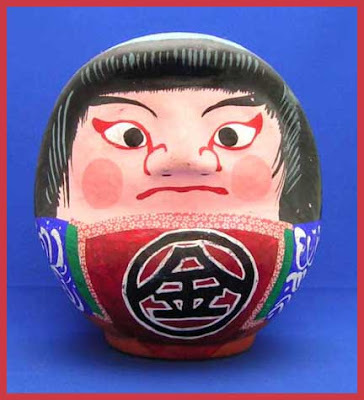 Here is a list of them in our Daruma Museum. Look at many more types HERE !
. 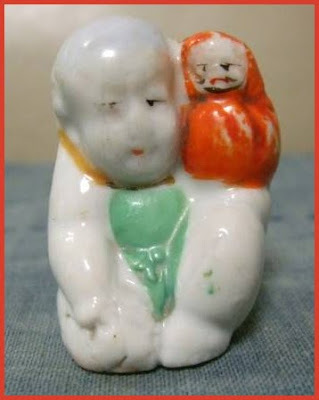 Kintaro 金太郎 "The Golden Boy"　Kintoki 金時 .
. akamono, aka mono 赤もの red things . 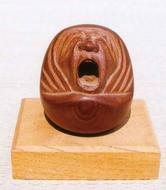 is a folk hero from Japanese folklore. A child of superhuman strength, he was raised by a mountain hag on Mount Ashigara. 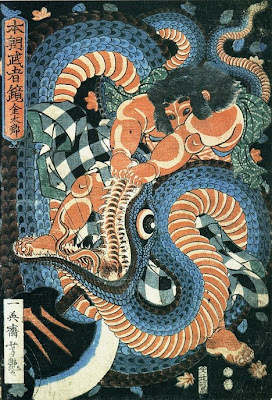 He became friendly with the animals of the mountain, and later, after catching Shutendouji, the terror of the region around Mount Ooe, he became a loyal follower of Minamoto no Yorimitsu under the new name Sakata Kintoki (坂田公時). 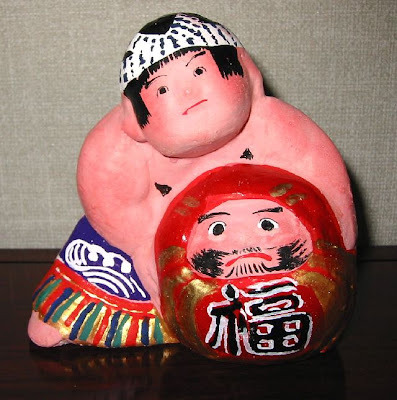 He is a popular figure in noh and kabuki drama, and it is a custom to put up a Kintarō doll on Boy's Day in the hope that boys will become equally brave and strong. Kintarō is supposedly based on a real man, named Sakata Kintoki, who lived during the Heian period and probably came from what is now the city of Minami-ashigara. 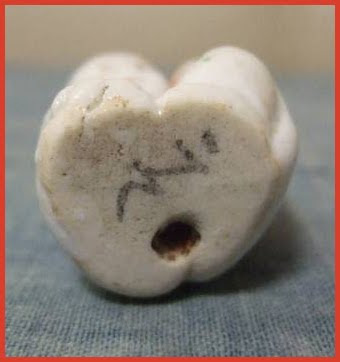 He served as a retainer for the samurai Minamoto no Yorimitsu and became well known for his abilities as a warrior. As with many larger-than-life individuals, his legend has grown with time. 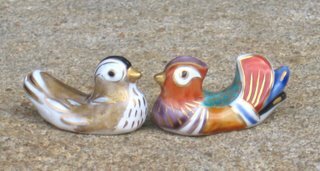 three famous TAROO of Japan. 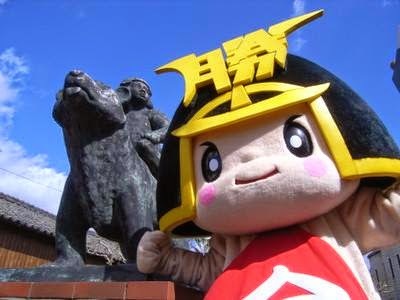 The town mascot of Sho-O village 勝央町 in Okayama. Legend says that Kintaro died in Shoo. More prints about Kintaro ! 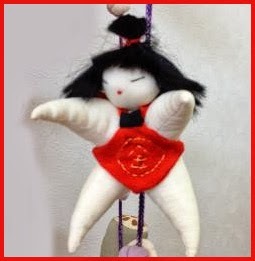 With the wish for good health for the child to grow up to be a healthy person.